The 2017 Happy Smackah 5k Fun Run / Walk is just weeks away. Here are the Top Reasons to Register for the Happy Smackah 5K today! Smackah Stickahs are back, thanks to Sticker Giant! This year, the tradition continues with our 2017 sticker, each participant will also receive two button stickers! Everyone loves stickers – make it to the finish and get yours! Skazma, a sixth-year sponsor of the Smackah 5k, will again equip every participant with a fantastic tee shirt – a great way to remember the amazing time you have with us! Available in classic cotton and running tech! Everyone loves tee shirts! Tasty Burritos will be on hand for a few bucks each, courtesy of our longtime sponsor and supporter Santiago’s! So bring some cash and gnash on some awesome Santiago’s burritos following your Smackah Success! Register today and you have the best reason ever to use the official Happy Smackah Race Bib maker. You can instantly get a custom HS Race Bib to print at home and bring with you to the race! Enjoy seeing all the unique, funny, supportive bibs on race day! 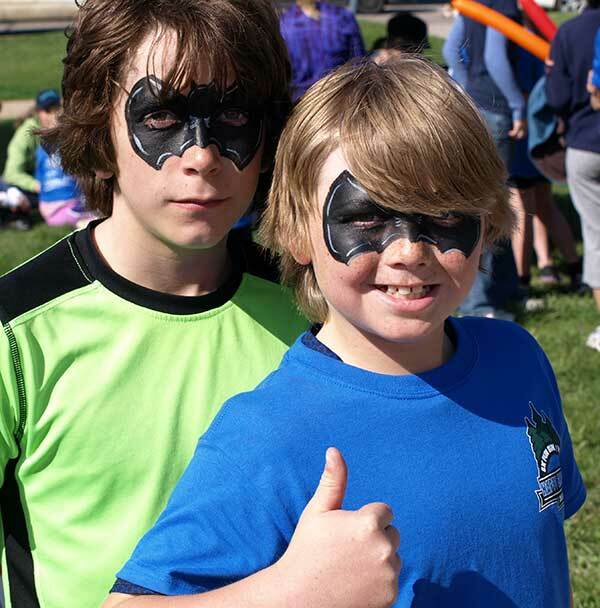 Face to Face Painting, a mainstay Smackah sponsor, will be there this year, offering face painting for all ages! Join us at the finish line for an awesome color design. If you can think it, Face 2 Face can paint it! McIntosh Lake and the Views! McIntosh Lake and the surrounding trails offer an environment of peace, serenity, and breathtaking views. There is nothing more tranquil than the calm waters (hopefully, but we’ll be there, rain or shine! ), music of the birds, and surrounding farm and wildlife. Every year, the Happy Smackah 5k occurs just ahead of another longtime local community running mainstay – the Bolder Boulder. The best way to prepare? Come out to the Smackah. As an untimed event, it’s a perfect, safe way to ramp yourself up into race shape. Practice and prepare at the Smackah and succeed at the Bolder Boulder! 400+ Early Bird registrants receive our Happy Smackah water bottle, in partnership with and courtesy of our sponsors Sand Dollar Realty & Clutch Automotive! If you missed Early Bird registration, have no fear – we’ll have some extras on sale at the finish for $10 each! The Happy Smackah 5K has become a great community event and tradition in the St. Vrain area, with over 5,000 registrants over the past six years. Don’t be left out – all of your friends are sure to be there. Join a bunch of friends and soon-to-be-friends in this community event where energy is always positive, and there are smiles all around. Come join them! And the number one reason to register for the Smackah: Braden! Every registration, every donation, every person that joins us on race day, is supporting Braden and his family. Braden is an amazing kid who’s showing with his battle an incredible spirit and strength to persevere. Let’s support him and grow our Happy Smackah family. All that is missing is YOU! And your family, friends, neighbors, cousins, grandparents, bosses, and anyone else you can bring! Register Today!